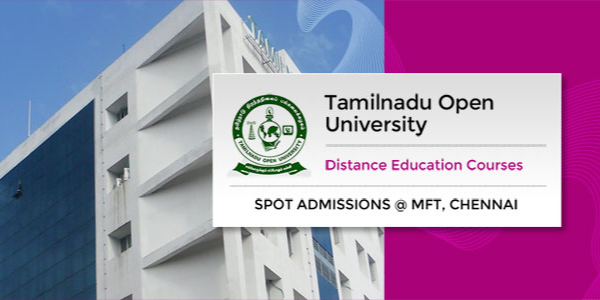 The Tamilnadu Open University was established by an Act (No.27 of 2002) of the Legislative Assembly of the Government of Tamilnadu to benefit those who have been deprived of and/or denied the access to higher education especially destitute, physically challenged, working men and women, economically weaker sections of the society, and those who discontinued education for various reasons, etc. In the main, it aims to reach the hitherto unreached. The University offers many Programmes in various disciplines. This step of the Government of Tamilnadu shall prove a boon for women, physically challenged, rural poor and marganalised sections of the society and we are committed to support it academically as well as financially. The University has also been recognised internationally when the University became a member of South Asian on Distance Education scheme throughout Asia. Besides, the University has been recognised by Govaty Foundation of France and has awarded “France India Heritage” recently. Tamilnadu Open University shall make available innovative, socially-relevant educational provisions that are learner-centred, seamless and are of high-quality by employing appropriate technologies to achieve equity in education, sustainable social transformation and composite national development. Evolve flexible and robust curricula to widen educational access, deepen knowledge frontiers and create entrepreneurial skill sets. Reach the rural communities through lifelong learning programmes for livelihood improvement. Establish networked environments for quality assurance. Bridge the digital divide and implement ‘anywhere, anytime’ learning environments. Become a digital repository for ODL in the State facilitating Research and Development for new knowledge creation. Coordinate and implement standards in ODL.